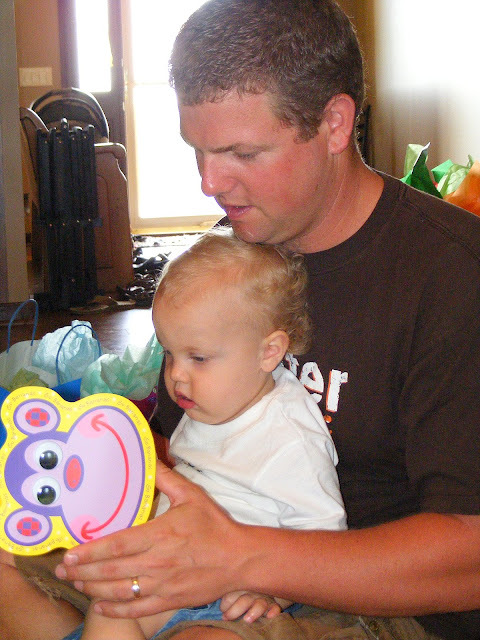 Life Down Our Lane: Monkey-See, Monkey-Do; Gauge's 1st Birthday Party! 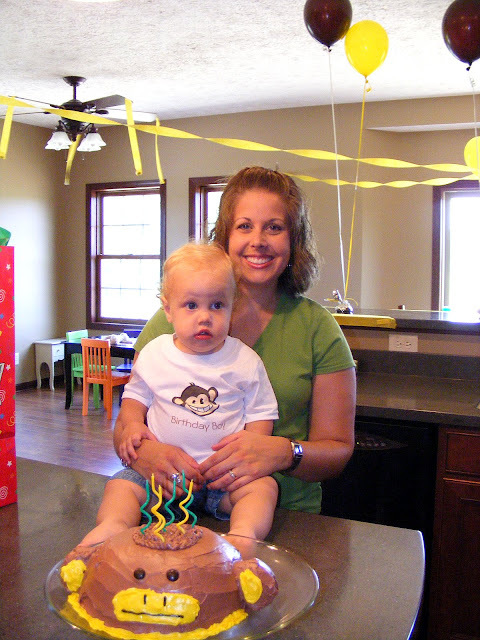 Monkey-See, Monkey-Do; Gauge's 1st Birthday Party! 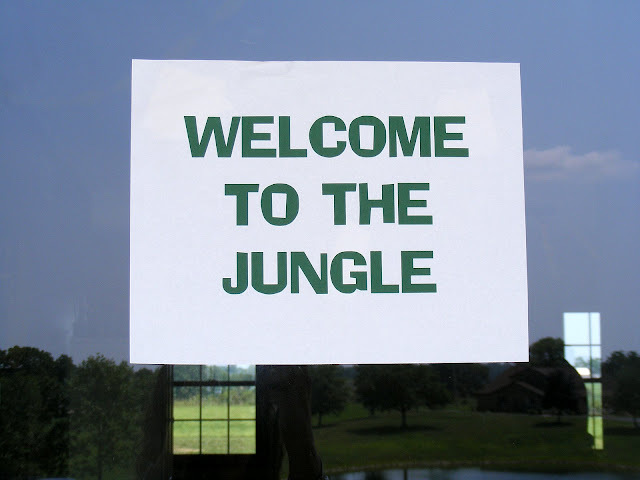 I think the sign says it all ! ! ! 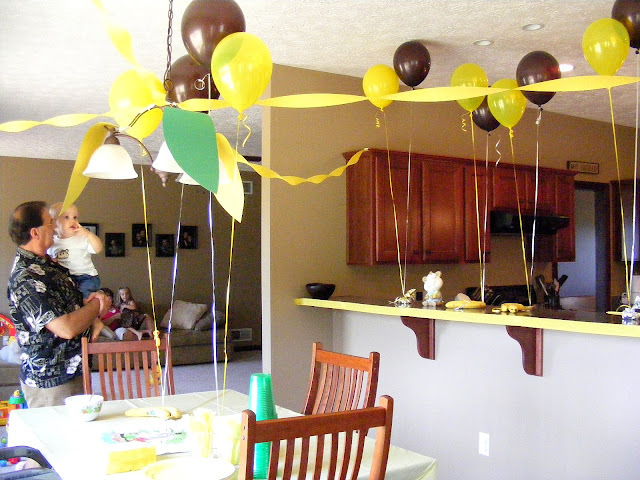 For our decorations, we chose yellow and brown. I hung banana leaves from our chandelier. We used bananas as weights to hold down the balloons. We also decorated with various other monkey things. Kerry's monkey is front and center on our eat ledge. I thought he made the perfect addition to our party. 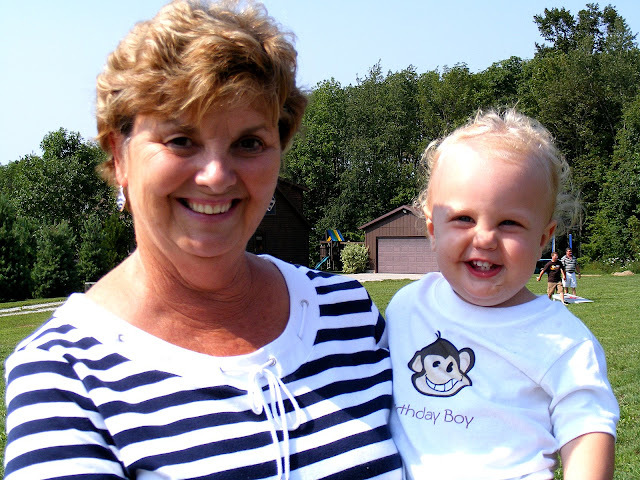 Mommy and her Monkey Birthday Boy. Isn't his Monkey Shirt adorable? 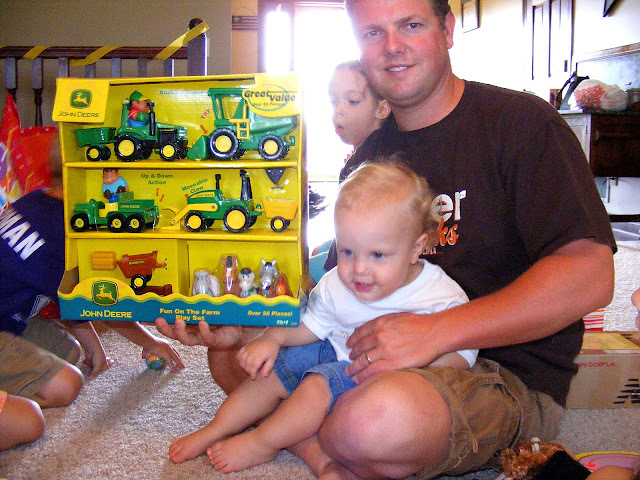 Daddy helping Gauge open all of his "Big Boy" presents. THE EATING OF THE CAKE ! ! ! ! Man this is good stuff!!!! When it was all over, he looked more like a "Sea Monster" than my handsome little boy. Come on Mom, you know you want to give me a great big hug and kiss. Now that I'm all cleaned up, I'm ready to pose for my photo op with Grandma. I think that overall Gauge's party went really well. 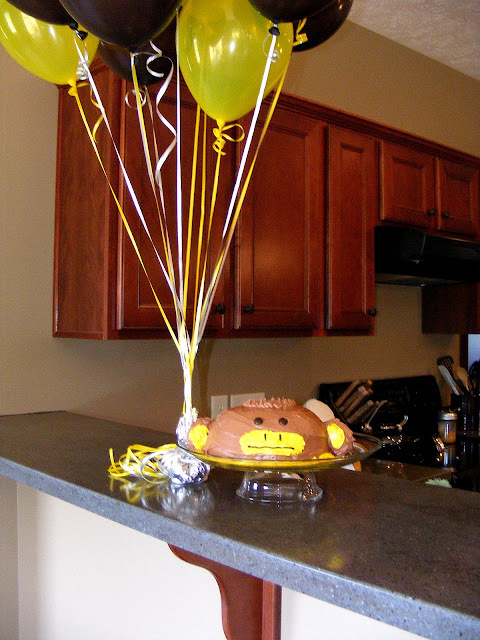 The decorations looked cute, and I am really please how Mr. Monkey Cake turned out. Gauge had a wonderful time and despite anything else...that is what matters the most! That turned out to be such a fun theme! And your cake...seriously...are you taking orders?!? The sea monster pic is hillarious. AWESOME cake-What talent. Wish I had that talent!!! I am totally cracking up right now! None of my three did anything close to that with their first cakes. It looks even funnier with chocolate frosting, too! Nice job on the cake! Oh my! What a mess! It looks like the baby was enjoying it anyway! Guess that's the important thing, huh? Oh. My. Gosh. Those cake photos!!! Did you just DIE of laughter?!?! I love it! HAPPY BIRTHDAY GAUGE! 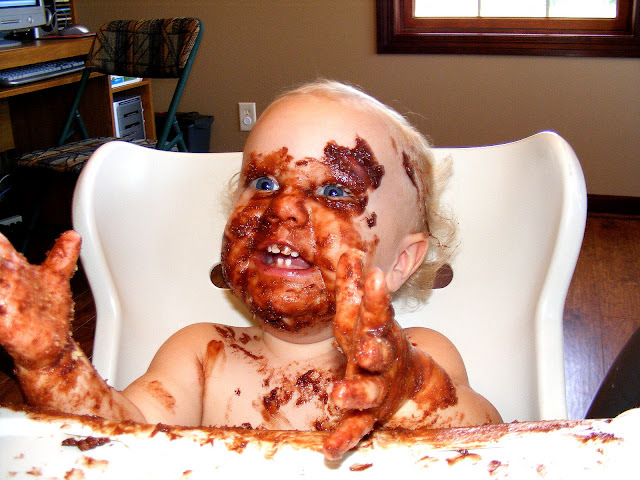 Oh my goodness...those eyes peering through all that chocolate icing!! What a hoot!! Wow! It looks like quite a perfect first birthday party. Those cake photos are hilarious. The cake by the way looked amazing before he devoured it as well. Wnderful blog. Keep up the great work. I love the pics. That video was great! Loved the after-stuffing-his-face pics! 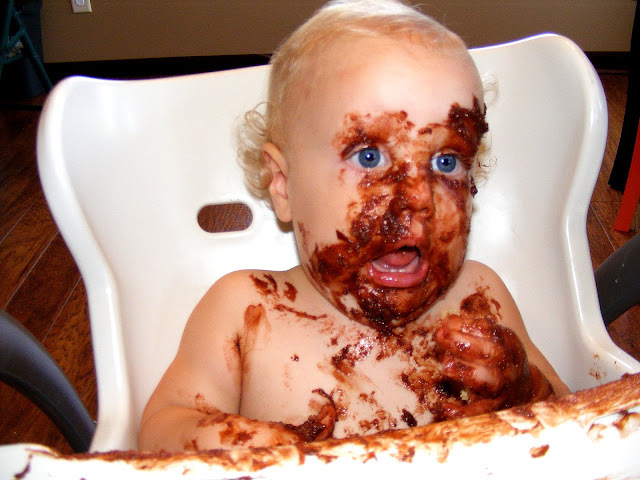 Looks like he really enjoyed that cake! Such a big boy he is now. Love you Gauge! That looked like two proud parents! It's amazing how fast kids grow! You two sure know how to grow'um!! Two great looking kids! Thanks for the email. 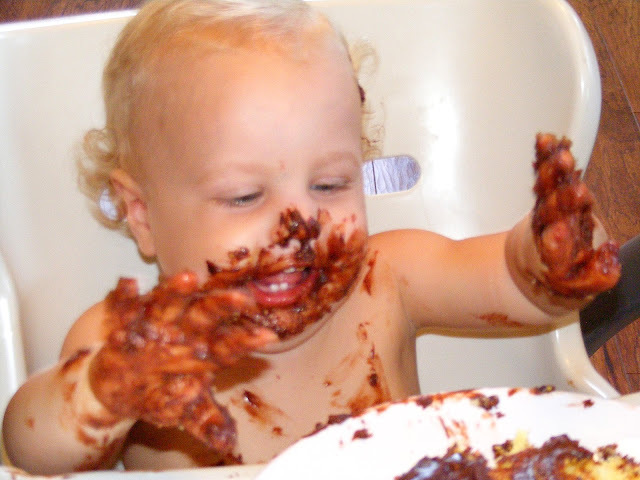 P.S I think Gauge might like chocolate..
Looks like you guys had a LOT of fun!!! 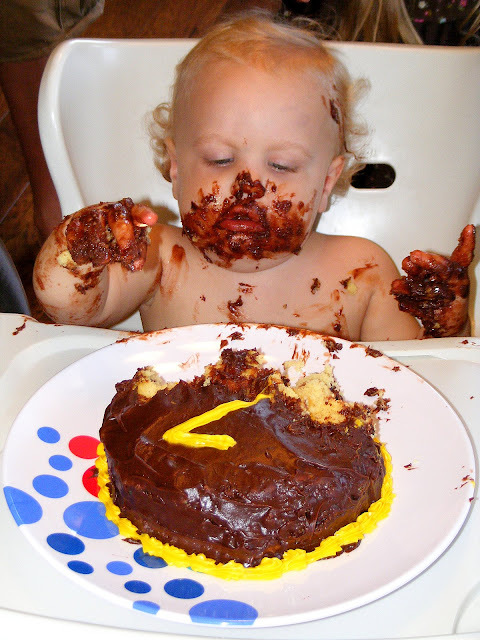 The cake eating picture should be made into a "facebook bumper-sticker"...lol Miss you all! Great party! Seems like you guys had fun. What's a kiddie party without the mess eh? Thanks for sharing. You don't know me...but I googled monkey party and found you. I LOVE your ideas! We are planning my son's 1st birthday party this month. 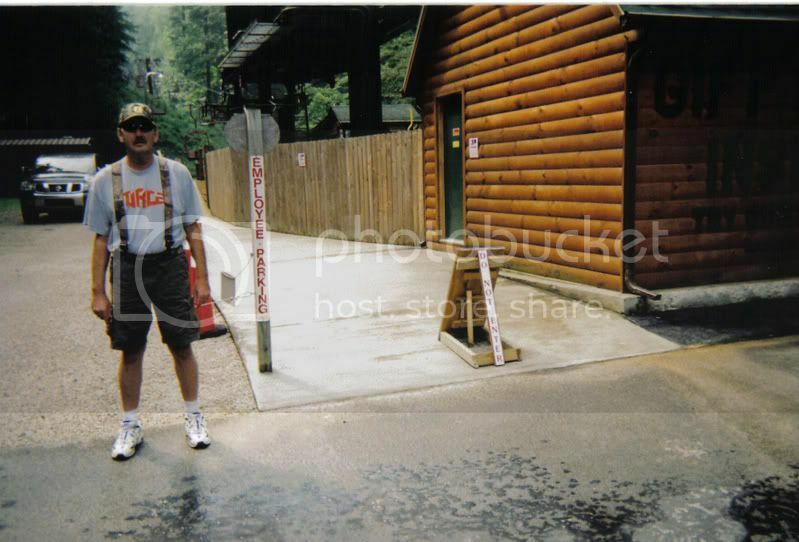 I'm curious where you got the monkey shirt? I tried clicking on your link, but it didn't work. Can you email me at roberts.nicole@gmail.com and let me know? Thanks! Love it! Great job on the cake. It's nice to know that Martha's creations can in fact be replicated :).